Franklin on Twiggs is located right where it says — on the intersection of Franklin and Twiggs Street. When it came to choosing a name owner Andrew Turek, explains that it just fit because there is a tendency for people in the Tampa Bay Area to name their local businesses based on their location. Turek opened the restaurant Fall of 2018 and the restaurant is slowly starting to become well-known over the past few months. Turek states that a lot of his cuisine inspiration came from growing up in a small beach town and living in Hawaii for five years. He got some of the ideas of the hot side and the bread from a guy who ran a restaurant in his hometown and the idea of the cold side from living in Hawaii discovering poke bowls. 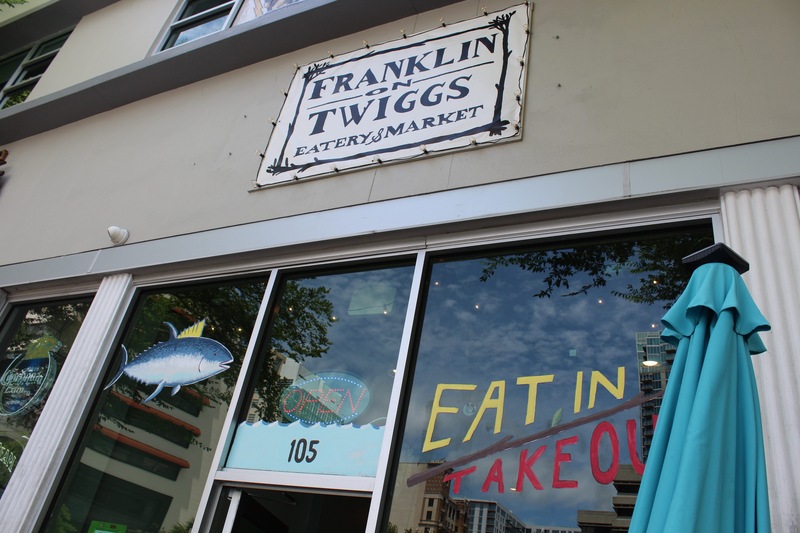 Franklin on Twiggs eventually plans on expanding the place once business starts to grow. Turek stated that he would like to incorporate a grab and go station where people can pick up their food, buy it, and go if customers are in a hurry. This is not your run-of-the-mill taco shop or seafood place. Franklin on Twiggs gives an interesting dimension with a mixture of different cultures. You don’t usually see this type of restaurant nowadays- giving Downtown Tampa a new unique spot to go to. Not only does the food make the restaurant unique, but the fact that there is a bike rack for customers to store their bikes while they eat. Another distinctive feature of Franklin on Twiggs is that they also repair bikes for their customers as well. The atmosphere in Franklin on Twiggs is chill and very hip. Andre Duarte, an employee at the restaurant, stated that it was a cool place to work at because everyone gets to know each other. Duarte states that the food is inexpensive with a friendly staff that is always happy to converse with their customers, especially with first-timers. Locals are starting to enjoy this place for what it is. It is unconventional in its own way, but that’s makes the place stand out. The certain level of uniqueness and out-of-the-box thinking is what one needs in order to create a successful local business in Tampa. You have to offer the locals a unique experience that they can get only in that one place. If you are ever in the mood to go out into Downtown Tampa and try new things, give Franklin on Twiggs a try. This is also a great way to support the Tampa community and its local businesses. There are many places in Tampa that are unique in their own way that deserve recognition. Reese Williams can be reached at reese.williams@spartans.ut.edu.